Unused real photo post card trimmed down to 4.25 x 2 inches. Undated and unidentified. But the paper manufacturer’s markings on the back (AZO, with all four triangles pointing up) date it to 1904-1918. The postcard markings on the back aren’t aligned with the image on the front, making me assume the photo was erroneously shot at a poor angle. But maybe it was just affixed to the paper wrong, and the edges showing errors were trimmed off. I don’t know enough about the “real photo post card” process to know which is more likely. 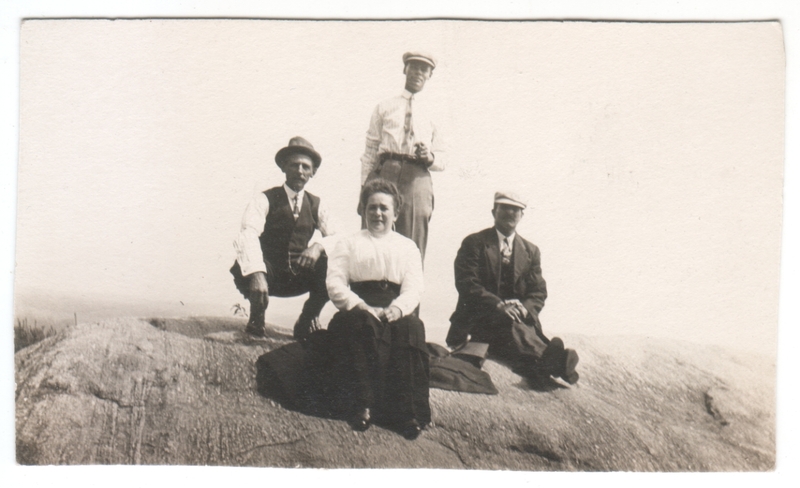 In any case, I wonder if anything was trimmed from the edges that might have given us a clue as to who these people are, where this rock is, and whey they are all perched on top of it. Their smiles make me want to climb up there and join them, and see what’s up.